The winger seemed to temporarily lose consciousness in a game against Leicester earlier this month but was allowed to resume playing. 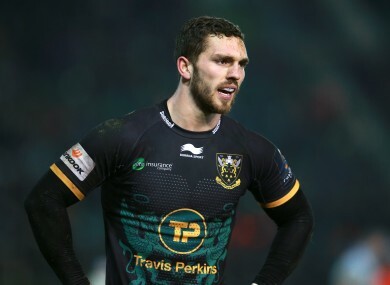 WORLD RUGBY WILL seek ‘further information’ from the RFU regarding George North’s latest head injury after an independent investigation found an ‘apparent non-compliance’ with protocol. Northampton and Welsh wing North looked to have been temporarily knocked unconscious during a Premiership game against Leicester earlier this month but was allowed to resume playing after treatment. The subsequent investigation, carried out by the Concussion Management Review Group, found the club were wrong to do so but Northampton still escaped without punishment. But in a statement released today, the sport’s governing body confirmed its disappointment with the results of the investigation and revealed it would be speaking with the RFU about the incident. “World Rugby’s number one priority is player welfare and our primary concern is the welfare of George and all players. It is therefore disappointing that apparent non-compliance with the sport’s elite head injury protocols led to George remaining on the field of play when he should have been immediately and permanently removed. While recognising that there is always a risk of human error, we will seek further information from the RFU regarding the factors behind the apparent non-compliance with World Rugby protocols and the outcomes reached by the independent review group. World Rugby will also continue to work proactively with its unions to ensure best-practice is implemented and followed in order to reduce the risk of a repeat incident within elite competitions”. North, who suffered three concussions in just seven months in 2014/2015, won’t be involved in his side’s Premiership match with Sale tonight. Email “World Rugby to speak to RFU after 'apparent non-compliance' regarding George North head injury ”. Feedback on “World Rugby to speak to RFU after 'apparent non-compliance' regarding George North head injury ”.